Some of the boys that were invited to camp out at Ernest Seton's estate, where Seton taught them Indian lore & how to live in the outdoors. 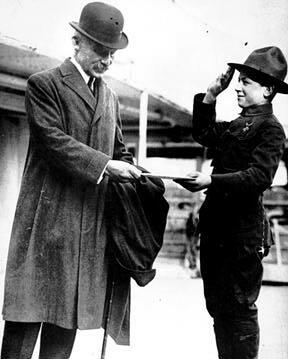 In 1912, a Scout greets Baden-Powell, as he arrives in the United States, with a letter from President Taft. 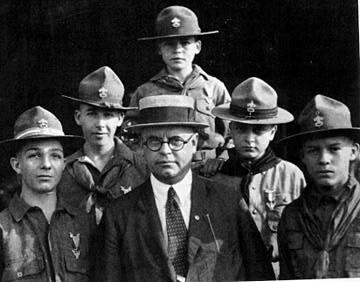 The first Chief Scout Executive, James West takes a picture with some of the early Eagle Scouts. 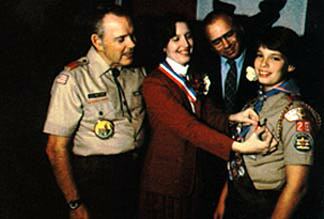 In 1982, Alexander Holsinger became the one millionth Eagle Scout. The Boy Scout movement was founded by British Lord Robert Baden-Powell. Scouting's first manual was both written and illustrated by Baden-Powell in 1908. Baden-Powell was a war hero because of his conduct at Mafeking, a strategic holding action during the South African war with the Dutch Boers in 1899. The early American troops took their cues from Baden-Powell's Scouting for Boys because there was no semblance of a national movement in the United States. 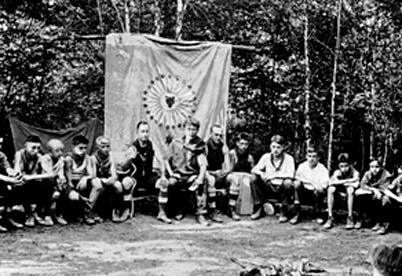 The YMCA men who started most of the early troops saw Boy Scouting merely as a promising adjunct to their programs for boys. Millionaire Chicago publisher William Dickson Boyce became involved in Scouting in 1909. He was visiting London in August of that year. One afternoon, the city was enshrouded in pea-soup fog. Boyce lost his bearings in the murk and was approached by a boy of about 12 carrying a lantern who offered to guide him to the address he was seeking. When Boyce produced a shilling, the boy replied, "No, sir, I am a scout. Scouts do not accept tips for Good Turns." The Unknown Scout took Boyce to British Scout headquarters. From that moment forward, Boyce's interest in Scouting grew. 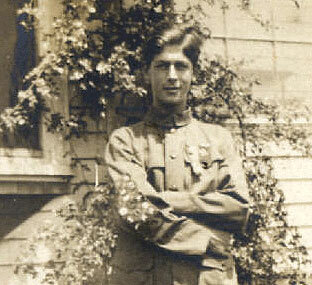 Boyce came home determined to start Boy Scouting in America. He apparently knew nothing of the troops already operating or of the YMCA's promotion of Scouting. 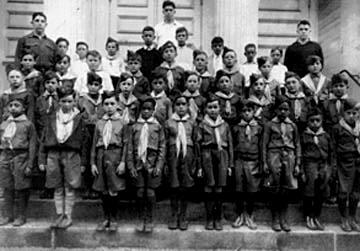 On February 8, 1910, Boyce filed incorporation papers for the Boy Scouts of America in the District of Columbia The purpose, he said, "Shall be to promote, through organization, and cooperation with other agencies, the ability of boys to do things for themselves and others, to train them in Scoutcraft, and to teach them patriotism, courage, self-reliance, and kindred virtues, using the methods which are in common use by Boy Scouts." One day in 1909 in London, England, An American Visitor, William D. Boyce, lost his way in a dense fog. He stopped under a street lamp and tried to figure out where he was. But, the boy stopped him. "No thank you, sir. I am a Scout. I won't take anything for helping." On February 8, 1910, Boyce and a group of outstanding leaders founded the Boy Scouts of America.From that day forth, Scouts have celebrated February 8 as the birthday of Scouting in the United States. What happened to the boy who helped Mr. Boyce find his way in the fog? No one knows. He had neither asked for money nor given his name, but he will never be forgotten. His Good Turn helped bring the scouting movement to our country. 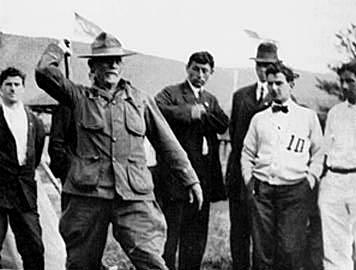 In the British Scout Training Center at Gilwell Park, England, Scouts from the United States erected a statue of an American Buffalo in honor of this unknown scout.